Today's Image of Mars is absolutely stunning. Mars Reconnaissance Orbiter's HiRISE camera took this image showing the inside of a 50km crater that lies within Becquerel Crater, a 167km crater. It shows dark dunes,varying colors and textures, and layered blocks tilted at high angles within the smaller crater. Some of the material imaged below is extremely ancient because the impact that created Becquerel Crater dredged up material from deep below the surface, then the impact that created the 50km crater dredged up even deeper material. The deeper the bedrock lies, the older it generally is, because more recent layers become deposited on top of it. Scientists believe that Becquerel Crater once contained an abundance of water. They came to this conclusion by analyzing the different layers exposed in the crater and determining that many of them are sedimentary layers that could only have been deposited by water. 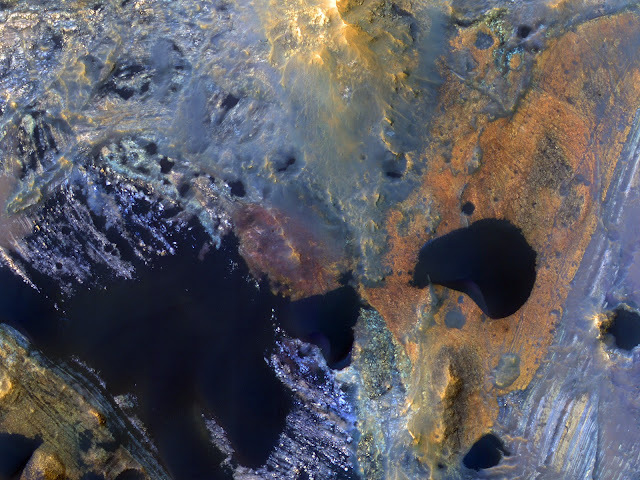 Analyzing the ancient layers and bedrock exposed in the 50km crater within Becquerel Crater will give scientists insight into the past climate on Mars and help answer the question, "Where did the water on Mars go?"